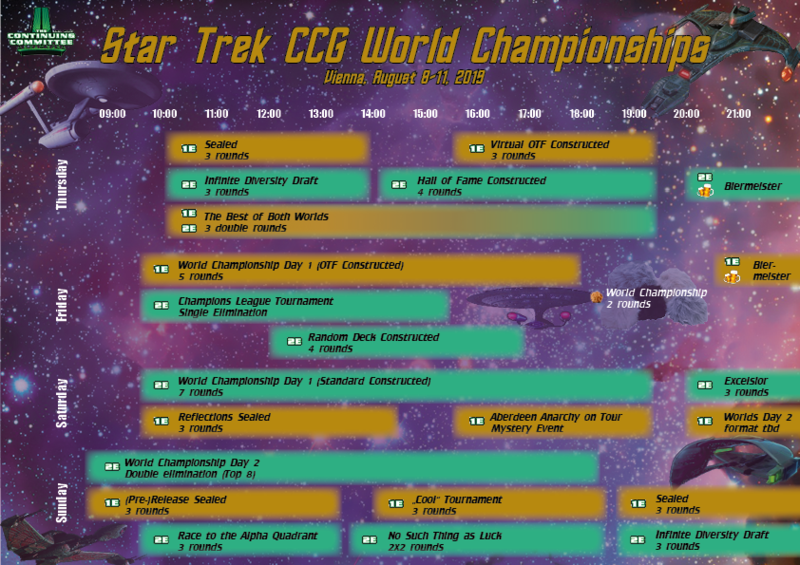 trekcc.org • View topic - German National Championship 2010 - Live Coverage! German National Championship 2010 - Live Coverage! The German Nationals weekend will take place in Kassel on the 19th & 20th of June. Saturday will have a "Warm-up" Regional. And beside the "usual" prizes, the winner will receive a Round 1 bye for the German Nationals. The National on Sunday will be open for everybody, no preliminary qualification is necessary. Last edited by thsch on Sun Jun 20, 2010 5:38 am, edited 1 time in total. Do we need decklists for any of the two tournaments this weekend? "Draw seven? Count me in!" A decklist is required for both tournaments. Re: German National Championship 2010 - Live Coverage! Two rounds are played. So far unbeaten: Tobias Rausmann, Tiemo Mittelstedt, Tyler Fultz, and Thorsten Wanek. Round three will see Tobias vs. Tiemo and Tyler vs. Thorsten. But with four more rounds to play, nothing is finalized yet. So check back to find out if players whose names do not start with a "T" will become contenders for the title of German Champion 2010! Btw, since Nationals is today, before Regional season is over, does the Munich Regional next weekend give the winner a Round 1 Bye into Nationals 2011? I know, I asked because I read on the description to yesterday's Kassel tournament that the winner of that Regional will get a Round 1 Bye for today, so I thought I might have missed something. Was that only a special prize for the Kassel Regional then? You guys are really throwing up a good tournament. As TD, are you playing? Thanks! Come over for Worlds and figure out yourself how awesome our tournaments are! No, I am only judging. now two more time zones closer to Worlds than before. Tyler and Tobias were victorious and are facing each other in round 4 in a game that could be the preliminary final. Meanwhile last year's finalist Michael Mittelstedt is trying to recover from losses in round 1 and 2. Tiemo Mittelstedt, Thorsten Wanek, Jens Petritzki, Kathleen Fultz, Tjark Ott, and Carsten Hartmann all have only one loss so far and are still aiming for the final. Three more rounds (and a final) to go. Who will become German Champion 2010? Tyler beats Tobias after 35 minutes! Who can stop the Maquis? Sorry, overlooked that one. Yes, the Round 1 Bye given out yesterday was a special prize for the National Warm-Up tournament.